Take a microwave safe bowl and add the spinach. Add 50ml water to spinach and cook in microwave oven on high power for 2 minutes. Allow one minute standing time and remove the spinach from the oven. Take a mixie jar and add the cooked Spinach and grind to a smooth paste adding water (around 50ml) if required. Peel onion and garlic. Wash ginger and green chilies. Chop the onions, ginger, garlic and green chilies. Take a mixie jar and add chopped onions, chopped garlic, chopped ginger, chopped green chilies, cinnamon, cloves and cardamom and grind. Add some water and grind the mixture into a smooth paste. Peel onion and chop finely. Chop the 2 garlic cloves. Wash and chop the tomatoes. 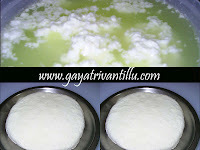 For low fat cream, in a mixie jar crumble paneer and run the mixer grinder to get grated paneer. Add milk and grind the paneer to a smooth paste. Take this low fat cream in a bowl and keep it in fridge till used.If using cream use it normally. Cut paneer into cubes and keep them aside. Heat a pan and add oil to it. When oil is hot add the cumin seeds. 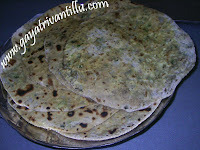 Fry for few seconds and add chopped garlic and chopped onions. Fry till the onions turn crisp and slightly browned. Now add the ground paste and mix well. Add red chili powder, coriander powder, cumin powder and turmeric powder and mix well. Then add the chopped tomatoes and mix. Cover the pan and cook till the tomatoes are soft. Meanwhile take kasoori methi onto a paper plate. Roast the kasoori methi in a microwave oven on high power for 10 second. Crush the roasted kasoori methi with fingers. When the tomatoes are fully cooked add the kasoori methi powder. Now add the blended spinach and mix well. Add salt and paneer cubes. Mix the curry well and cook for 2 to 4 minutes. Now add the cream or low fat cream and mix well. Cook for a minute and transfer the tasty palak paneer to a serving bowl. 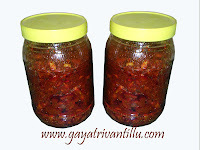 Serve hot with roti, naan, paratha etc.. In this recipe I have used low fat cream in place of cream. If you prefer your preparation to be rich add about 1/4cup of cream. However the low fat cream is light on stomach without much difference in taste. Choice is yours. Fry the onions and tomatoes well so that they get mixed up with the spinach gravy. Also, when fried, onions and tomatoes give a good taste to the dish. Always roast the fenugreek leaves and crush them to get the full aroma. Garnish the dish with cream and serve hot. Recently i ws searchin for a gud webssite for my cookin......suddenly i found ur website which is amazing...from that day onwards i keep on watchin all ur videos i jus addictd to ur videos.......even i tried ur palak paneer recipe it came out very delicious.....my husband cleand the bowl of palak paneer...even the narration of ur recipies are very clear...please can u make seperate theme for healthy baby foods&also can u give some recipies of baby corn?? In your site i saw Palak Paneer and I try it. It very nice and easy methods your following. Your recipes are rellay good mam. My requiest is I want to know the recipe of Malai Kofta. If you provide that its really great. Thank you for all of your good recipes.